Cirque du Soleil – a circus experience like no other! Have you been to see Cirque du Soleil yet? If not, do yourself a favour and go! I was a Cirque du Soleil virgin; I had heard a lot of hype about this performing troupe, and although I really knew very little about their shows (except that they were supposed to be spectacular), I had always wanted to see one. I really wanted to go when we visited Las Vegas the year before last, but my husband wasn’t too keen, so when I heard they were performing in Newcastle I resolved to go. I found a willing accomplice (and fellow Cirque du Soleil virgin) in my sister-in-law. So, I booked tickets and we went yesterday – Sunday. After a rear-end accident on the way to the event, we eventually made it and sat down about 30 seconds after the start of the show. It was absolutely fabulous! Now, I have to admit, I was a little concerned at the beginning – there are few words spoken and the singing that occurred was in French, I think, so I didn’t understand anything. I also felt a bit lost at the start because I couldn’t really follow the story line. I only knew what I had heard, that the show was essentially the world created as result of a young girls imagination. The concerned feelings didn’t last too long, and I was quickly absorbed by the performances; there were amazing feats of strength, balance, coordination and endurance. There is plenty to look at, sometimes I didn’t know where to look on stage, there are often other skits happening in the background; even the transition between acts was well performed. Quite a few acts take place in the air with the performers suspended from the roof over the main stage on various types of apparatus that actually move across the stage. Before I knew it an hour had passed and it was time for intermission. The second half of the show was just as good and passed just as quickly, but I think my favourite act was the “statue” couple – a man and woman who perform an absolutely amazing act of balance and strength as the two never lose contact, but create seemingly impossible feats of balance, strength and flexibility (I was in awe – I think everyone else may have been too). The whole show was supplemented with some great music (which I found hard to pigeon hole – sounding at times middle Eastern, and at others like Irish folk music), but was perfect for the show and all performed by the live band on stage. 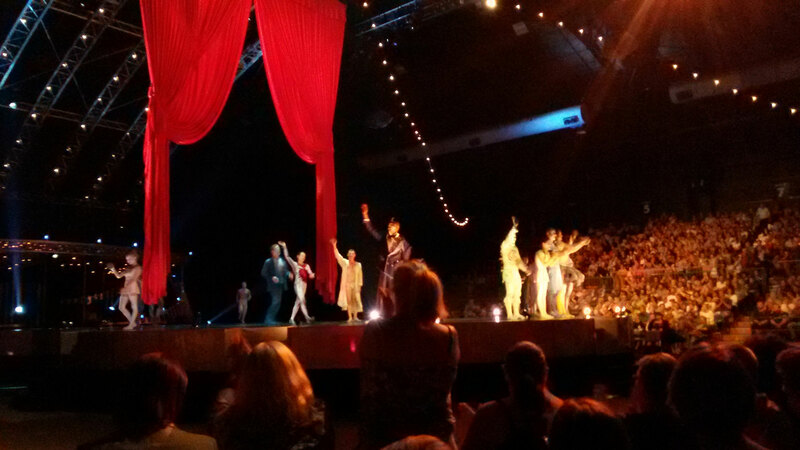 Taken at the end of the show – I was too engrossed to take pictures during the performances! This was a great spectacle and definitely worth the ticket price. We had great seats, close enough to see the performers muscles rippling with strain and effort, but if I were to give one piece of advice it would be to sit on the right side of the stage (as you are looking at it) as there were one or two performances where you would probably get a slightly better view (and don’t get the premium seats on the floor in front of the stage – you can’t see the performers feet – which I, for one, like to see). I would also recommend a little research first – so I have provided a very quick run down about “Quidam by Cirque du Soleil” and a link to a preview video if you would like to get a taste of it. Quidam was the ninth stage show produced by Cirque du Soleil and premiered in in April 1996 as a big-top show in Montreal; it was converted into an arena format beginning in 2010. The show is the result of the imagination of a girl named Zoe who is ignored by her parents. If you want to book tickets to see the show in Australia, go to Ticketek, but you will have to hurry; the Newcastle season ends on January 24th and then the show heads across the Tasman to Auckland and Christchurch in New Zealand. Prices vary from around $76 to $160 each for adults. 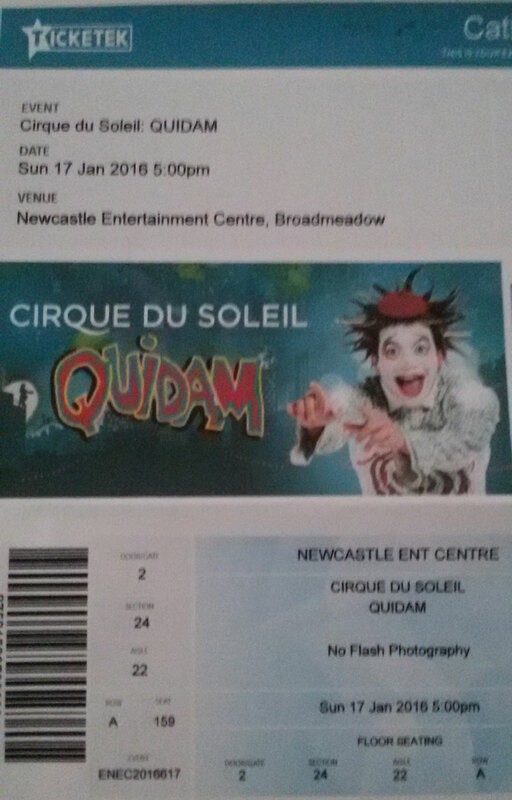 This entry was posted in General, Life in Australia, Newcastle, Travel and tagged Cirque du Soleil, entertainment, Quidam by Catherine Wright. Bookmark the permalink. I’m so glad you got to go! I love Cirque du Soleil. You are right, the performances are just amazing.